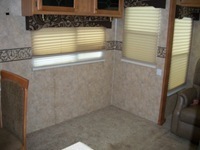 The other day Carol said she was ready to move the craft center in to the RV. That is a good sign because our days remaining in the house are numbered. Moving from 1700 square feet to 400 square feet is not something you do over night. It has to be done in stages. We are fortunate that we have a little time to complete this move. When we bought our RV, we decided the couch would have to go. It was nice but was not something we needed when we get on the road. Yes, it folds out to make a bed for overnight guests. We did not need the extra seating when considering what we wanted in that spot. Carol loves quilting and crafting. The idea of replacing the couch with a craft center was the solution. So, off I went to my woodshop to make a crafter for Carol. I removed the legs from a 6 foot folding table and built a more suitable frame using the same construction technique found in RV’s Here is what I came up with. The only thing I had to purchase was a couple of 4×8 sheets of 1/4” oak plywood. Home Depot had some on the rack marked as “damaged” for $2 per sheet instead of $13.00 per sheet for the good stuff. Since the plan called for cutting the sheets, I was able to find 2 sheets that would work. Now all I need to do is get it into the RV. Our daughter took the couch from the RV so that left a nice spot for the craft center. Yikes! Pretty tight fit. Sure hope it fits through the door. That sucker is glued together and will not come apart without damaging it. If at first you don’t succeed, try, try again. YEAH! That’s what I’m talking about. Once I figured out how to get it into the door and get it turned, the rest was pretty easy. Now to accessorize it a bit. The bins on the right are on wheels so they roll in or out as needed. Carol has not seen this in the RV yet, but I think she will be pleased. 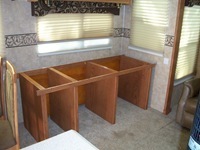 When traveling, the bins will be stowed with drawers facing in and pushed all the way in. The sewing machine will fit under the center section on the floor. The space on the left will be filled with stackable containers. And it weighs less than the couch. PS – When you come for an overnight visit, you will be sleeping on a air bed on the floor. Hope that is OK. This entry was posted in Texas and tagged craft, qulting, sewing. Bookmark the permalink. WOO-HOO, looks great…I'm sure Carol will be very pleased — great job! I'm very impressed with it! I see you followed the "measure twice, cut once" rule…good fit! Very nice! Making it your own is what it's all about. We also took out our couch and dining table to make it fit "us". We too hope to hit the rid in a few months. See you down the road. Looks GREAT! This Carol is terribly jealous… I'm still working on a how to bring the sewing machines with us. Really great. I wish I could compress my stuff down to that. Nice job! That looks terrific.My wife, Paulette, is an avid quilter and after showing her your setup she is very envious.Me? Ain't gonna happen!! Wow, I am impressed. wonder if I could convince Paul to get rid of the couch!You do beautiful work. I love this! What an excellent idea . . . I had pretty much figured I would be doing most of my sewing outside on the picnic table when we finally hit the road . . . but you're putting new thoughts in my head! I, too, am a quilter and plan on taking my machine with us. I am truly envious of your setup. Looks wonderful. Carol will be delighted I'm sure. Fantastic idea and great job! We will be hitting the road in about a year and I was looking for some ideas for my crafting stuff, was considering a Toy Hauler so I could use that space for my massive craft collection….thanks for the idea, maybe I don't need the hauler now! Your RV mod is awesome! A perfect place to quilt and love the movable bins! Always need that storage space as well as the work space. Love it! Lucky Carol! Great job on the modification! 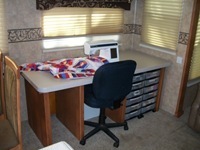 One requirement for our camper was that it had to have room for my quilting. 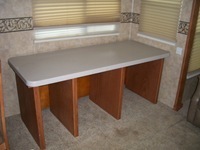 Found a 31′ travel trailer that works perfect with 2 places in the bedroom that I can put a table and leave it up. (One definitely works better than the other, but hey it works too.) (Had to have a TT so my husband could hall his motorcycle in the back of the PU!) The armoire is about 5′ tall and baskets that match the woodwork go on top to hold my stash. Sure there are odds and ends scattered here and there, but it works and I can basically leave stuff out. There’s space underneath for storage too. Do any of you quilters know of an online group for traveling quilters? Be nice to meet up here and there. Thank you. Enjoyed reading your blog and pictures. Love your RV and french poodle. Poodle was my wife’s dream dog. She was no longer able to groom her so poodle, Qianna, was placed a home on Corpus Christi. That was our home town for 20+ years before full time RVing. Now we have MeiLing (Chinese Crested), Cody (Golden Retriever) and Patches (Calico Cat). 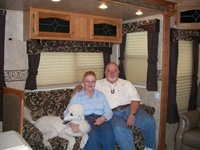 This is my dream for the future: a standard poodle and a quilting table in an rv! I love your mod. Great work!